:: Facial of the Month - Complimentary Pep up gel and Precious Pearls Puff with our Over the Moon Facial! :: Question of the Day: How do I protect my lips from sun damage? News today of one more way human activity might be helping wreck the planet: Research by Italian marine biologists, reported in Environmental Health Priorities, suggests that the sunscreen that washes off the skin of swimmers in the tropics may be contributing to coral bleaching. Corals, which have been in sharp, worrying decline around the world for some time, lose their color and turn white when something causes the zooxanthellae, a symbiotic algae that live with them, to die off or be pushed out of the reef by the coral - and it's a very bad sign for the health of the reef. So what can you do to help prevent future contamination of the coral reefs? Wear Colorescience Sunforgettable SPF30 and protect your skin (and the environment) with minerals, not chemicals. Our SPF30 is a physical block that sits above skin. It's not absorbed into your body like other sunscreens, and it won't harm the environment when you hit the waves. 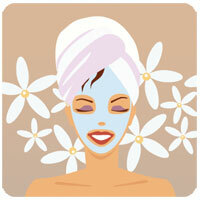 Facial of the Month - Complimentary Pep up gel and Precious Pearls Puff with our Over the Moon Facial! Mention this newsletter and receive a COMPLIMENTARY Pep up gel and Precious Pearls Puff - a $12 value - with the purchase of our Over the Moon Facial. Pearlescience Pep Up Gel is lighter and more delicate than bronzing creams and cover ups. The cool translucent gel feels like the coolest silk against the skin, and its subtle bronze glow enhances natural coloring without overpowering. The Precious Pearls - tiny beads of bronzing powder enhanced with microscopic flecks of genuine pearl powder - add a deeper glow. zakkerz (n.) a temporary pant roll-up wrap used to hold pants that have been rolled up to a shorter length for flat shoes. zakkerz original $26 - magnets close on the roll-up. Best suited for lightweight flimsy fabrics that need extra hold on the roll-up. zakkerz long $27- magnets close above the roll-up holding single pant layer. For medium to heavyweight fabrics, jeans, and Capri roll-ups. Our clothes are an investment. If you have pants that have been hemmed for high heels but want to wear them with flat shoes or sneakers, then you need zakkerz. If you would like to be able to go walking during your lunch break, then you need zakkerz. If you are tired of dragging your pants through rain puddles and snow, then you need zakkerz. Roll pant leg up to desired length, then wrap zakkerz around bottom of pant with one end of zakkerz inside pant leg and other end outside pant leg. The magnets bring the two ends of the zakkerz together - holding the roll-up in place. zakkerz will hold your rolled pant legs in place when you need to temporarily shorten them without damaging your pants in any way! Ta-tas® Brand Clothing cares about women and their families. That's why they are committed to making a significant contribution in the fight against cancer. They give a portion of their gross sales to the fight against the disease. That means, with every sale, every item, every day, all year, every year for as long as they exist, they are fighting cancer from every angle they can. And since their launch in 2004, they have given $162,000 to the fight against cancer. Join us and help "Save the ta-tas®." Our Next Beautiful Benefit is August 9th! Question of the day - How do I protect my lips from sun damage? Most women think their balms and glosses have got them covered, but experts say they're dangerously mistaken. Certain Lip balms and glosses can actually increase your chances of developing a skin cancer. "Many people do use sunscreen; however they tend to forget their lips," says Christine Brown, M.D., dermatologist on the medical staff at Baylor University Medical Center at Dallas. According to a recent study, less than one-in-four Americans wear some form of lip protection. Experts say this is concerning since the lips are not only more susceptible to aging from chronic sun damage, but are also more prone to developing serious cancers. "When skin cancer occurs on the lower lip it has the potential to be much more aggressive and metastasize to surrounding lymph nodes," adds Dr. Brown. What's worse - many of us unknowingly attract the sun's rays to our lips by using balms and glosses. "What most people don't realize is they're actually increasing light penetration through the lip surface by applying something clear and shiny to them," explains Dr. Brown. "For people who are planning to be outdoors for more than 20 minutes at a time-they really should have a specific lip sun block with an SPF of 30 ideally," says Dr. Brown. To protect your lips, Dr. Brown says the first thing you need to do is get a lip balm or a lip sunscreen that has an SPF of 30. You should apply it in the morning under any lipsticks or lip glosses and then reapply throughout the day just as you would a lip color. Remember, it is just as important as wearing sunscreen on your face and body. So what are the signs you may have developed a skin cancer on your lip? First of all, skin cancers are more likely to appear on the lower lip. If you have any changes to the color of the lip surface - if an area turns opaque or white - or if you have persistent peeling or flaking of a spot on your lip - you should have it checked by a dermatologist. We just happen to have a new SPF30 Lip Salve from Colorescience, and you can try it free! Purchase a Colorescience SPF30 brush, Rock n'Roller Ball or Orb and receive a COMPLIMENTARY new SPF30 Lip Salve ($22.50 value). Big things come in small packages, so they say. The NEW Colorescience Sunforgettable SPF 30 Sun Salve offers big lip protection in mini orb style. Made with Zinc Oxide and Titanium Dioxide, the Sun Salve offers superior defense against the harsh elements while Jojoba Oil, Cocoa Butter, Mango Butter, and Shea Butter keep lips moisturized and hydrated. The delectable spearmint scent, made from Spearmint Essential Oils, will keep your lips cool and your breath fresh. Time at the beach or lake can get away with us, so even with the best of intentions, we can sometimes get a sunburn. Here are some easy, cost effective ways to relieve your mild sunburn. Simply fill a spray bottle with vinegar (apple cider or white), and use it to apply vinegar to any sunburned areas of your body. (Use a cotton ball or rag to apply vinegar to your face). Be sure to reapply every few hours, or whenever the sunburned feeling returns. The acetic acid in vinegar soothes and moisturizes sunburned skin - just what you need to feel better now, and minimize unsightly peeling later. You can also relieve sunburn by soaking in a cool bath with 1 lb of baking soda. Soak for about 30 minutes. You can also use cool compresses soaked in baking soda. Of course the best thing is to prevent the sunburn by wearing your sun screen, limiting your time outside between 11 am and 3 pm (when the sun is strongest), and wearing protective clothing. I believe I am actually here the entire month of July!